(5) five lengths of 5’ x 3” lattice (this is the width for a queen/double). IMPORTANT NOTE: try to find wood that is not bowed or warped. If there is a a bow, you should put a long strip of the 1x1" to straighten it, instead of using little blocks. 6-1/2 feet of 1”x1” square stock cut into 3” strips. 1. Paint your front of your wood lattice strips including the edges. To let to let some of the grain show through, you can thin the paint with acrylic medium or water to get the right opacity. 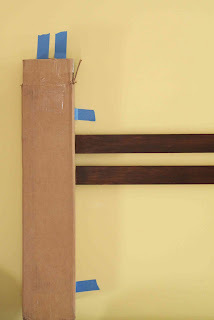 4.Mark the location of the left side of strips on the wall, and use a box or other straight, lightweight item as a jig by taping it along the side using painters tape. 5.Remove the backing from the Command Strips and, using your level and the jig (and a friend if possible to help hold the pieces!) apply starting from left to right, pressing firmly until you feel the ‘click’ to get the command strips to adhere. 6.You can use a ruler, OR a book or other item as a spacer guide (jig) to determine the space between each slat. Repeat until all the slats are up. Slight adjustments can be made by gently pulling off the slat and re-adjusting.Please note that this is a decorative piece, and not made to lean against. for a more permanent installation, screw the blocks into the wall using the appropriate anchor and affix the slats using brads and glue.